I loved visiting your wonderful website. Our family's time at 637 Washington Boulevard was certainly eventful, and we have many stories that we would love to share with you. 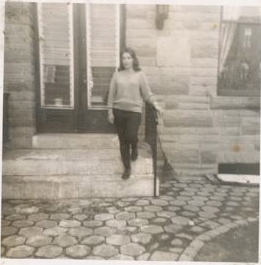 Our mother, Louise White, was a passionate supporter of the Ridgely's Delight community, and she worked hard to revitalize and protect the historically rich–but deteriorating–area in the late 1960's. Her love for the community grew out of the love for her beloved house at 637 Washington Boulevard. She had a love affair with that incredible house–its marble fireplaces, wide staircase, and the beautiful magnolia tree in the back courtyard. Years later, she would choke up when she talked about how much she loved it and how hard it was to leave the community she fought so hard for. On the day 615 was scheduled to be demolished, my mother bundled me up, took me by the hand and walked me to the end of our block. I was around eight years old and home sick that day. She stopped at the side of the house at 615, crouched down in front of me and told me to stay put. Confused, I watched her walk to the doorway of the house. A wrecking ball suspended from a large crane swung gently back and forth, yards away from where she positioned her 5 foot 2 inch frame in the doorway. She was wearing a white furry hat and looked defiant and beautiful as she faced down the huge metal ball. I, of course, started to cry, terrified that my mother would die in the rubble of the house she so dearly wanted to save. The standoff seemed to last forever, but probably was over fairly quickly. My mother left the doorway after she was assured that the demolition had been halted, at least temporarily, by a last-minute court order. She walked to me, hugged me and wiped my tears. She spoke for a few minutes to a television reporter and then we walked home, hand in hand. I felt her pride and sense of elation; I don't think either of our feet touched the ground on the short walk home. Unfortunately, her victory was short-lived. A little after midnight, the wrecking ball came back to life and finished what it had started. Our mom was broken-hearted. The loss of 615 was too much for her, and we moved out of the city not too long afterwards. Shortly before our mother died, I went to visit 637 and was given a tour of the beautifully restored house now named Rachael's Dowry. My mom was supposed to go with me but she was in the hospital at the time. I drove straight from the house to her hospital room and regaled her with the details of the restoration. She grew misty-eyed and talked of all the dreams she had had for the house that we did not have the money to accomplish. Our beloved mother died in December of 2010. She never made it back to the house, and I wonder if it was just too painful for her. 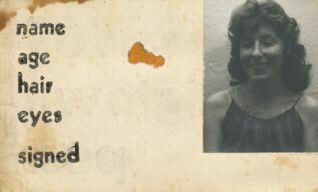 These photos are of my mom in front of 637 and of her press pass from the Pigtown Post.